With its incredible power and beauty, Niagara Falls stands out as one of the natural wonders of the world. It should be visited at least once before you die. Located on the Niagara River, at the Canada-US International Boundary, Niagara Falls is comprised of three gorgeous waterfalls – the huge Horseshoe Falls that are situated in Canada, the American Falls which are just across the border in America and the Bridal Veil Falls. 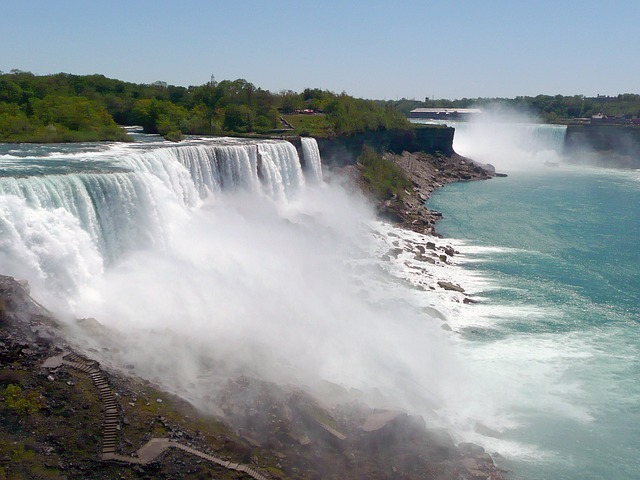 The Niagara Falls is a sight to behold for all your senses. The thundering roar of the falls mixes with the sight of the water and rising mist, and the smell of the fresh, crisp air cooled by the torrent of water relentlessly spilling over the edge of the falls. Niagara Falls is the second largest falls in the world based on the width. More than 6 million cubic feet of water falls over the crest line every minute in high flow. The waters in the river are owned partly by Canada and partly by the USA. The international border runs through the middle of the river. The verdant green colour of the water flowing over the Niagara Falls is a byproduct of the estimated 60 tonnes/minute of dissolved salts and rock flour (very finely ground rock) generated by the erosive force of the Niagara River itself. Everyone visiting us always visit Niagara and having been there umpteen times, I have become an expert tourist guide and can take you through a thrilling experience at Niagara. Once I took acclaimed Malayalam music director Sharreth and his team of musicians to Niagara. When everyone went for a boat cruise to the falls, Sharreth stayed back and I did not know how to spend the next hour as I had no clue about music and had nothing much to discuss with him. So we strolled along the falls and suddenly I asked Sharreth to sing some Raga with the sound of the falling waters as a backdrop. A Raga uses a series of five or more musical notes upon which a melody is constructed. He stopped, paused for a few minutes and said he got a Raga and he started singing it and I captured it using his cell phone. I handed over his cell phone and said you must be the first musician to sing a Raga like this and hence must treasure it. A few years back we came to know that General Jambusarwalla and Mrs Hufreez Jambusarwalla were coming to the Niagara Falls, US side and we all decided to meet them there as they did not have a Canadian Visa. Our children were very excited to meet him as they had heard many an anecdotes and references about a great human being and a military leader from their dad. The General kept insisting that we should not undertake such an effort, but the decision had been made and we decided to comply with it. On that day we drove from home, crossed the Canada-US border and reached the hotel where the couple were to check-in. We received them there, and on meeting us, the General said “What better can a retired General from the Indian Army ask for at the Niagara Falls than a General Salute from a Colonel and family”. We then had dinner, spoke for about two hours, and we drove back home at midnight. The children were overwhelmed by the couple’s warmth and love and were really impressed. While driving back, our son Nikhil said that the General was so down-to-earth and that he did not fit into the frame of a General which he had in mind. He was expecting a rigid, tall and a perfect military figure from what he had heard about him, but what he experienced was a simple human being full of energy, wit and humour, who came down to a kid’s level to converse with him. Nikhil summed up his final opinion with a statement – He is very “Napoleonic”. “Great things in your life will mostly come in short packets. One got to look for them, identify them, explore them, imbibe them and learn from them” was my reply. 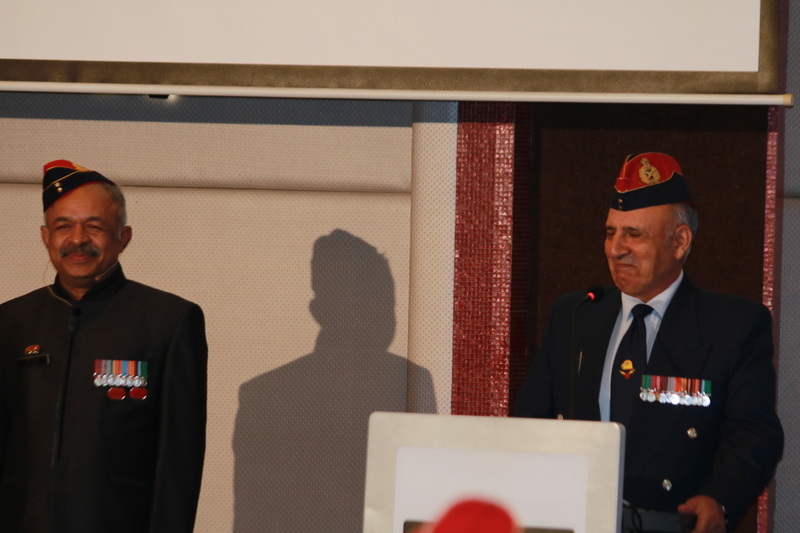 It was indeed a great honour for me to have had General Jambusarwalla gracing the occasion of release of my book in Bangaluru in March 2017. A new narrative on the falls away from the usual touristy spiel…Worth reading. Narration of one of the seven wonders, Niagara falls is incredible. Its unique by its size and opulence which Col Reji could explain in minute details and very vividly. I am sure the veteran General had enjoyed the unexpected company of you and family at such an awesome place with nostalgia.